The Department of Work and Pensions is now adopting psychocoercive techniques to get unemployed people back to work, aiming to make us accept the notion that unemployment is a fault deriving from individual attitudes rather than a condition rooted in our current political and economic conditions. In agreeing with Dr. Scott’s analysis, we urge disabled people, care workers, NHS workers, psychologists and jobcentre staff to contest this system of oppression. Dr. Scott denounces the way cognitive behavioural therapy has been adopted to pressurise people into employment, on the back of neoliberal ideas of normality, positivity, and well-being. But if these conditions create our misery, and if we are told that our individual attitudes are not good according to the ideology of the neoliberal capitalist system which the DWP and the state are frantically trying to prop up, then resisting the imposition of state-sanctioned psychotherapies and behaviours also means reclaiming those bodies and minds, attitudes and ways of being that the DWP would like to fix as faulty and harmful – for capitalism. Seeing such resistance and reclamation as a form of sabotage through which we can make the normality of capitalism unworkable in our everyday life, in jobcentres and assessment centres, in medical settings and the workplace, is inevitably also a call for collective action and solidarity in all these contexts. By Dr Bruce Scott, Psychologist, Psychoanalyst, Jedburgh/Edinburgh, Scotland. Member of the Philadelphia Association, London and College of Psychoanalysts-UK. Author of Testimony of Experience: Docta Ignorantia and the Philadelphia Association Communities (2014) and contributing author to R.D. Laing: Fifty years Since the Divided Self (2012), both published by PCCS Books Ltd.
Scottish Mental Health Awareness Week (4-10 October) is fast approaching and the expression “mental health” will be used by the majority involved in the debate. However, the use of this term is not a benign practice and therefore should not be left undisturbed or unchallenged. “Mental health” is a phrase everybody uses without thinking. The phrase seems harmless; how can two little words be of any consequence, derail a leftist critique of capitalism, or even back up the system the left intends to critique? I want to be clear however, although I am critical of the term “mental health”, I am in no way diminishing the mental distress that people experience. However it is important to recognise how the use and consequences of the term “mental health” does detract from the real suffering of people. When one uses the term “mental health”, in a context where it means everything (e.g., concerning mental distress) the concept of health and ill-health subsumes the all of the context. However, the concept has so much slippage when subjected to a detailed critical analysis, it deteriorates into a phantasm that continually haunts in the background, because the concept cannot contain or represent in an ideal way, when it reduces or reifies human experience in such a way. Activists from all political persuasions often put forward ideas concerned with campaigning for more or better “mental health” services, getting more CBT (cognitive behavioural therapy), or sometimes the more economically viable computerised version of CBT. To my mind this reeks of neoliberalism; there is, from “mental health” activists almost no interrogation of the concept of “mental health” from a critical psychoanalytical or philosophical perspective. The uncritical acceptance of such a term may seem harmless, but that is the ruse which capitalism wants to play to trick us. The blatant missed trick regarding the cultural hegemony of “mental health” by the so-called radical left is startling as is the thoughtless core demand of good “mental health” from the state The acceptance of a Gramscian “common sense” (e.g., alienating/mystifying ideology, see Gramsci, 2003) and the demands for a master, or treats from a master in terms of idealist ideas of happiness or “mental health” is conspicuous as is the utter lack of campaigning against the “mental health” regimes that are being imposed on the most oppressed in our country. The confusion, and subsequent alienation that the ideology or discourse of “mental health” brings to our psychological reality is compounded and perpetrated by the discipline of psychology, which purports to be a neutral science. As Boym (2010) argues, psychology, rather than contesting alienation and confusion which is the cultural hegemony of “mental health”, psychology exacerbates alienation and moves to celebrate them in a positivist ‘carnival of inauthenticity’. Alienation from ourselves is positively encouraged through psycho-biological frameworks (including genetic theories) which permeate the discipline of psychology and dispute and destabilize ideas of free will and responsibility. The crux of this matter is, under psychology, human beings are purported to be machines, and machines become faulty and need fixing. But, we are not machines in this sense. The “mental health” system and its institutions play a pivotal role in shoring up and defining our psychological lives which underpins acceptance of capitalism. Allan Francis, the former lead editor of the Diagnostic and Statistical Manual of Mental Disorders (DSM, 2013)-the book which gives our present culture all the labels we use when it comes to “mental health” is highly critical of the validity and reliability of such DSM disorders and if the method of DSM disorder creation was to be used with physical disorders, it would be rejected whole heatedly by the medical community. The basic categories of mental disorder which are outlined in the DSM have not been arrived at through painstaking research, but through the operation of committees. Practitioners cannot decide with any consistency who or who does not have a constructed disorder. A good example is schizophrenia where research shows that barley half of highly trained psychiatrists and practitioners schooled in the medicalisation of mental disorders believe in the label. It is a hypothetical disorder for which no medical tests exist and mental health practitioners cannot agree on its diagnosis. Worse still, the operation of these committees has been thoroughly corrupted by the influence of the pharmaceutical industry. Strong financial ties have been identified to operate between pharmaceutical companies, and those who are responsible for developing the diagnostic criteria for mental disorders (See Greenberg, 2011; Kutchins & Kirk, 2003). One needs to be aware that the function of psychology and psychiatry within a capitalist system is to expand the categories of the “mental illness” thereby creating consumers of psycho-pharmalogical products, and “service users” of state sanctioned psychotherapies of adaptation, therapies which are sanctioned by the capitalist state on the basis of propping up the cultural hegemony of “mental health”. This system creates fear and submission to an ideology which controls and mystifies the masses. Marx (1973) recognised this assault of alienation and mystification upon the subject. Marx theorised that the proletariat under capitalism is no longer a subject. Under capitalism, the subject is not permitted (e.g., we cannot free associate); the subject has to produce good “mental health”, positive cognitions etc; a perfect foreclosure of free subjecthood and of uncertainty; an uncertainty which needs to be, as language and reason cannot contain all of the truth of what it is to be human and to live; capitalism transforms the labouring power of the subject into an object; objectifying and reflecting the ‘scientific knowledge’ of our epoch, to abide by pseudo-scientific truths of what is “mental health” and what is not. Let me be clear, it needs to be understood that there is no good evidence to suggest that there are any biological deficits, genetic abnormalities, or chemical imbalances related to mental ill-health or mental disorders. The evidence base for “mental illness” is so poor. There are no medical tests a physician can give you to test for a mental illness. And just to add, like the poor science of the taxonomy of mental disorders (e.g., DSM, 2013), psychometric tests of “mental health” problems do not validate the truth of having a so-called mental disorder. The work of Mary Boyle (2002) on Schizophrenia, David Healy (2003) and Irvine Kirsch (2009) on depression and SSRI antidepressants, Joanna Moncrieff (2003) on so-called biochemical imbalances in so-called mental illness, and Kutchins and Kirk (2003) on the mythology, nosology and taxonomy of mental disorders, shows well enough that the cultural hegemony of “ mental health” from a medico-biological perspective is a myth, and perpetrated by corrupt drugs companies and people with vested interests in the “mental health” industry. The advent of the UK’s state sanctioned IAPT services (Improved Access to psychological therapies) which makes CBT more widely available (to the determent of more subversive psychotherapies) is primarily designed to get people back to work, functioning well enough to fit in with capitalist and neoliberal ideas of normality, positivity, and well-being. A darker shadow has been created with this cognitive revolution where the Department of Work and Pensions are now using CBT and other psychocoercive techniques to get unemployed people back to work. This latest development is in effect sanctioning the idea that the fault of being unemployed lies with the individual, not with the political and economic conditions that create unemployment and misery. Further, there is more and more evidence accumulating that CBT is nothing more that quick fix. As outlined in Shedler (2015), in controlled scientific studies the positive effects of CBT post 1 year after treatment has ended only endures in 5% of people that are treated. In essence, the hypnotic effects of willing oneself to see the positive wears off. One has to realise that the whole fundamental foundation of CBT rests upon a mystification. One of tenets of CBT is to target dichotomous thinking; in other words to help people out of black and white thinking. For example, I am unsuccessful vs. other people are successful and I am a failure vs. other people are not failures etc. However, theoretically, CBT is built upon the very foundation of dichotomy. It is built upon the foundation that there is such a thing as mental ill-health versus happiness or well-being, and, that there is a “good” way to think versus a “negative” way to think. This is a philosophical tautology which infects the very nature of the context in which CBT is delivered and received. Can not believing in the theoretical tenets of CBT’s notions of dichotomous thinking (or the concept of mental health) not be a positive thought which ameliorates “depression”? The philosopher Gilles Deleuze argued that philosophy should create a necessary disturbance contra the mystifying totalisations of state philosophy especially in matters of the psyche (see Nichterlein & Morss, 2016). The quote by Nietzsche above often disturbs. This is a good thing; we should all aim to be disturbed and not shy away from being disturbed. Disturbance is just the start. If one “listens” to the disturbance and goes with it, then the necessary critical work begins. Too often disturbance (philosophically) is covered up to protect sensibilities and/or a dogmatic “truth” is countered against the disturbance. This perpetrates what Deleuze would argue is, contra to true human becoming, so common in societies of control and state philosophy. Boym, S. (2010). Another freedom: the alternative history of an idea. London: University of Chicago Press. Diagnostic and Statistical Manual of mental Disorders: Fifth Edition (2013). American Psychiatric Association. Gramsci, A. (2003). Selections from prison notebooks, Q. Hoare & G.N. Smith (Ed. & Trans). London: Lawrence and Wishart. Kirsch, I. (2009). The emperor’s new drugs: Exploding the anti-depressant myth. London: The Bodley Head. Kutchins, H., & Kirk, S.T. (2003). Making Us Crazy: DSM – The Psychiatric Bible and the Creation of Mental Disorders, Washington D.C. :The Free Press. Marx, K. (1973). Grundrisse: Foundations of the critique of political economy, M. Nicolaus (Trans.). London: Penguin. Nichterlein, M., & Morss, J.R. (2016). Deleuze and psychology: philosophical provocations to psychological practices. London: Routledge. Nietzsche, F. (1974). The Gay Science, W. Kaufmann (Trans.). Ontario Canada, Random House. Shedler, J. (2105). Where is the evidence for “evidence based” therapy? The Journal of Psychological Therapies in Primary Care, Vol. 4, May 2015: pp. 47–59. i A longer and more comprehensive version of this article appeared as two-part podcast read by the author. The podcasts can be listened to in full here: www.ungagged.podbean.com. 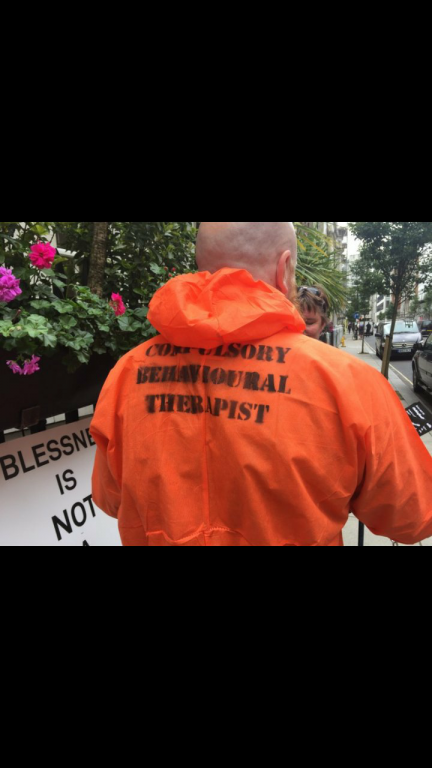 The advent of the UK’s state sanctioned IAPT services (Improved Access to psychological therapies).... is primarily designed to get people back to work, functioning well enough to fit in with capitalist and neoliberal ideas of normality, positivity, and well-being.